Subway began back in 1965 when Fred DeLuca set up a sub sandwich shop in order to help pay his way through medical school and reach his goal of becoming a doctor. Soon, his sandwiches became a huge success, and now you can find a Subway at the best locations in your local town and city, with more than forty thousand shops worldwide. From the beginning, the Subway brand has been the leading choice for people seeking healthy and nutritious fast food meals, and today you won't have any trouble finding the approximate calorie intake of each Subway sandwich, as they continue to offer transparency to help you make healthier choices. For fresh sub rolls packed with top quality ingredients - you can't beat a Subway. Packet sandwiches from the supermarket just don't compare, and with Subway sandwiches, you can choose exactly what you do and don't like, saving you from biting into your sandwich to discover and unpleasant surprise. With £3 lunch deals, regular specials and side options, Subway make tucking into your favourite sandwich everyday affordable. How do I use my Subway vouchers? When you pay, show or give your voucher to the cashier. If you enjoy eating with Subway often, they have a handy loyalty scheme which could help you to save money on your favourite sandwiches. Those who frequent Subway will certainly benefit from signing up to a Subcard, which works by earning you points each time you make a Subway purchase which can then be redeemed against more food in the future. Earn 10 points for every £1 spent in-store, and save your points until you've got enough to claim a free sandwich! There’s no need to skip breakfast, because Subway can get you out of bed with a good start to the day. Look out for Subway breakfast vouchers to save on your choice of hearty bacon egg and sausage sandwiches. There’s a breakfast for everyone at Subway, said head on down and get the most important meal of the day for low prices you can’t afford to miss. When Do Subway Restaurants Open? Subway restaurants are open for breakfast, lunch and dinner seven days a week. However, depending on your location, actual opening times may vary. The best way to find out the opening times of Subway stores local to you is to use the store locator tool on their website which will provide you with the information you need. Do Subway Cater for Special Dietary Requirements? Subway understand that not all of us are able to eat every food option they have to offer. Along with vegetarian and some halal options, Subway will also cater to customers with allergies and other special dietary requirements. Simply let the Subway employee in charge of your food know before you order. Can I Book Subway for a Party? Some larger subway stores may allow you to book parties or large group visits. You might also want to consider Subway Platters, which are great for parties and can be delivered to your door in certain areas. 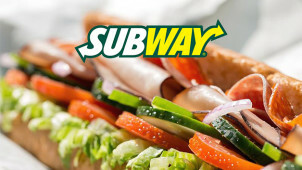 Subway provide contact forms on their website for you to get in touch with any suggestions or feedback, find them here. When it comes to sandwiches, Subway is the largest retailer in the UK, serving over two million customers just like you with healthier alternatives to fast food. When it comes to your preferences, Subway likes to make sure that they get it spot on, so you can use your Subway vouchers to make a tasty meal that’s tailored to your liking with a huge choice of different rolls, fresh fillings and toppings to choose from. If the 6-inch just won't satisfy your hunger cravings, pick up one of our current Subway footlong deals to see if you can save on a mega meal. The footlong offers great value for money and is guaranteed to keep you going all day, so grab one for less before the discount is gone! Subway cater for a range of dietary requirements, not just sandwiches. If one of your main New Year’s resolutions in 2017 was to be healthier, there’s no need to forgo a trip to Subway as their customisable menu allows you to be as healthy (or unhealthy!) as you like. Plus, Subway offers will make sure choosing the healthy option is the cheaper choice. Salads can be made with or without sauce and there are low-fat dressings to choose from, making it the perfect place for a quick meal out, even if you’re dieting!